Do you ever wonder what your pets are up to while you're not at home? I know I sure do. Especially if I have to make a long trip somewhere. I personally wonder if my dog and cat are getting along OK. I try to keep them separated when I'm gone, but my dog has taught herself how to open some of the doors in my house so separation doesn't always work I've learned. 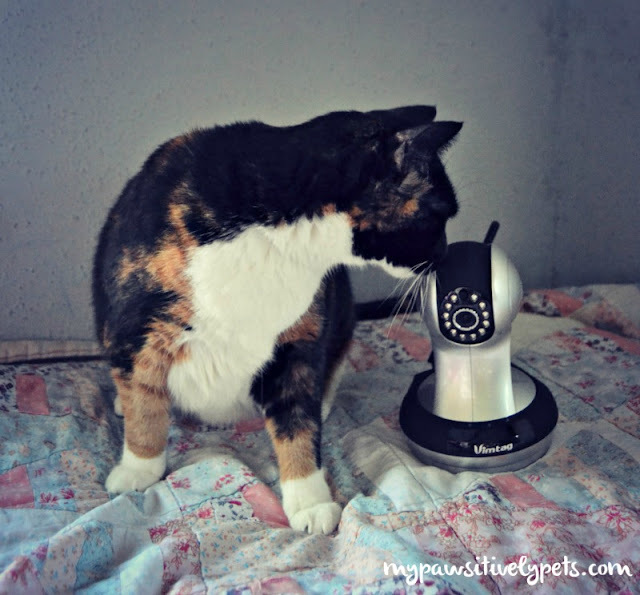 Keeping an eye on your pets while you're not home has become extremely easy recently. 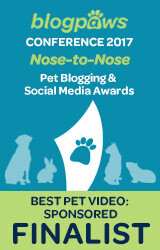 There are now security monitoring cameras available that allow you to monitor your pets and home from your smartphone. I've been using a Vimtag VT-361 HD Indoor Camera for a few weeks now and think it's kind of fun to spy on the pets to see what they are up to. This post is sponsored by Vimtag. We are being compensated to help spread the word about Vimtag Security Cameras, but Pawsitively Pets only shares information we feel is relevant to our readers. Vimtag is not responsible for the content of this article. This post contains affiliate links. Vimtag asked me to try out their VT-361 HD Indoor Camera. Because I am always curious about what my dog and cat are up to while I'm not at home, I thought it would be a cool gadget to try out. Setting the camera up was fairly easy. I just needed to plug it into the wall and my router, and then download an app on my phone. The app is available for iPhone and Android smartphones and allows you to monitor your home directly from your phone. After I got everything set up, I connected it to my WiFi so that I could move it around the house. When I'm out, I will check out what the cat and dog are up to with my phone. 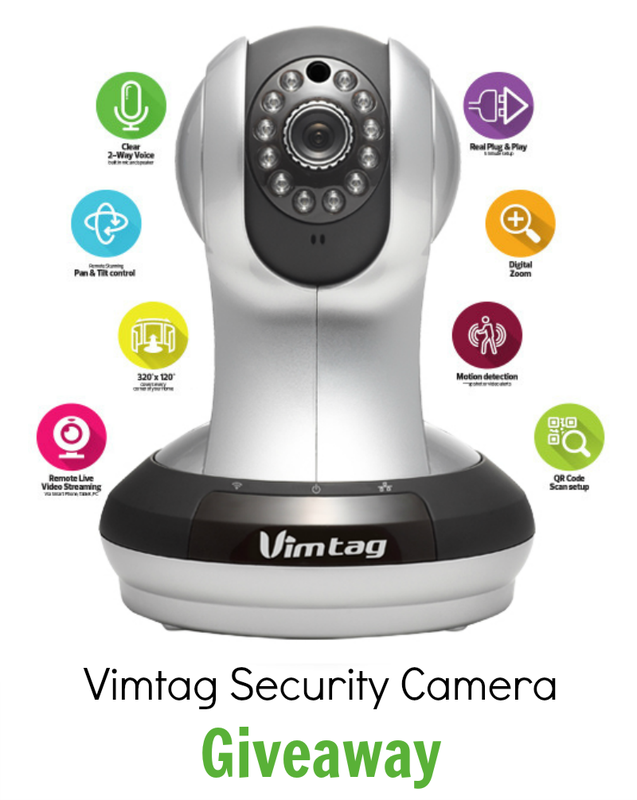 The Vimtag security monitoring camera allows me to zoom in, has a 360 degree view, and I can move it up and down. When it's dark in the house, it changes to night vision which just looks like a black and white picture but the images on the screen are still very clear. The Vimtag camera also has a two-way audio feature. I can not only see what my pets are up to, but I can hear them. I can also speak into my phone's microphone to talk to them through the camera. I have tried talking to Callie the cat a few times, but it seems as though she wasn't able to hear me. There are still several features of the Vimtag security monitoring camera that I have not used yet. It allows you to set recording schedules and will send email alerts too. I haven't discovered anything extremely interesting about Shiner and Callie while I'm away from home. They seem to be behaving themselves mostly... I caught Shiner sniffing the trashcan once and Callie scratching around, but that's about it so far. Safety. If your pet gets hurt or needs help while you aren't at home, a security camera can help you identify the problem sooner. It can also be helpful in the event that there is a burglary in your home. Solved mysteries. Which one of your dogs keeps chewing up your throw pillows? Who keeps snatching your shoes? Which one of the cats is throwing up on your bed? Expose the culprits! If you have multiple pets, this can be helpful information for diagnosing medical conditions too. Curiosity. If you're just curious to see what the animals do all day, a security monitoring camera can help you find out. Peace of Mind. It's easy to worry about our pets when we aren't there with them. I know I do sometimes. Having a camera can help put you at ease and allow you to check in whenever you want. 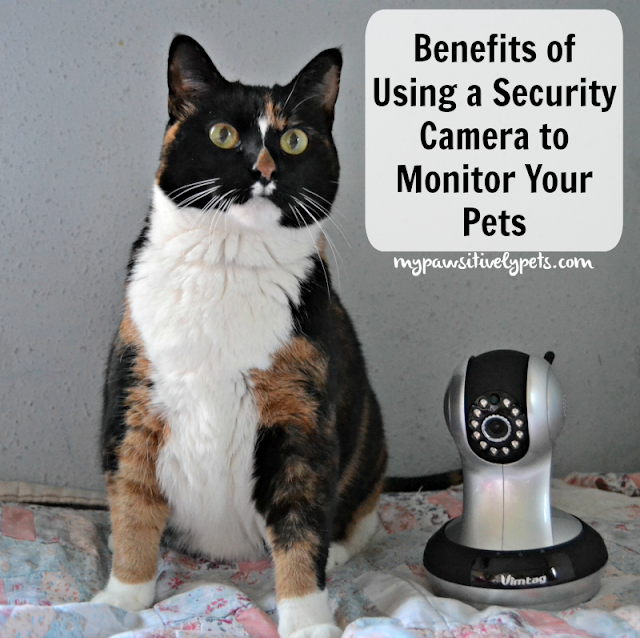 In addition to using a security camera to monitor your pets, you can also use one for many other purposes. If you have a human baby or even older children, you can use a camera to monitor them. Security cameras are also great for monitoring disabled or elderly people and you can even speak with them using the Vimtag camera. And of course, security is important. You can make sure your home is safe and secure no matter where you are. You can purchase a Vimtag camera like ours online at their website HERE or on Amazon HERE. We are partnering with Vimtag for a giveaway! Get your paws on a FREE Vimtag VT-361 HD Indoor Camera valued at $99.99. This giveaway is open to contiguous US only (sorry Alaska and Hawaii, void where prohibited by law), ages 18+. To enter just fill out the Rafflecopter form below. Giveaway ends on December 5th, 2015 at 11:59 pm CT. Winner will receive a code to redeem on Amazon for a free Vimtag camera, shipping charges still apply. Oh, my human needs to get this! She should see what Binga's up to while she is out of the house! What a pity! the free item is not available. What's the video resolution? VGA or 720p. It seems the image quality is not high when checking your snapshots. We just got one to review and are going to start trying it out today. Should be fun. Our ADT Home Security system came with a security camera. I LOVE it. I can spy on the cats when I'm not home, and because it is a security camera it will automatically record when it senses movement. I love going through the archives and watching all the clips of the kitties, especially from the middle of the night when I was sleeping. The only thing it's missing is audio capability! I can't hear anything, and I can't talk to the cats either. This camera you've got is really neat. I'll be entering so that I can put a camera in another room, as I can only see one room with our camera. That sounds really cool! The audio on this camera is definitely a nice touch. Our security system comes with a security camera feature, but we haven't taken advantage of it. We've been thinking about adding the service to our account. It would be nice to keep an eye on the dogs and the property. Since they have an app, I can check with my phone. Oh, how cool! We got an indoor spy camera once but it didn't work very well at all. Ma and Daddy-dog were very disappointed. Aw that's too bad. I hope this one continues to work well for us, but so far no problems. I'd love to see what the new furbaby is up to when we are gone. Things are never where they were when we left, so I'd like to see how he does it. Oh gosh! I want a home camera sooooo bad. I just want to be able to log in on my phone and check that everything is okay. It's great for home security too. I would love to have a Vimtag Indoor Security Camera to see what Schooner & Skipper are up to while we are gone. I would like to know if he is surfing the counter and the table. Or which one is making a mess ..taking off the cushions, taking the pillows out the doggie door, ruffing up all the blankets and more. Lol - sounds kind of like Shiner! But at least I know it's her and not anyone else. I would love to see what Dexter and Marceline do while we're away all day! The mom really would love to have a camera to spy...er, we mean to watch us when she's not home. If we don't win this...she's gonna ask Santa to bring her one for Christmas. Love this so much! it would be awesome to see what Lucy does while we aren't home. I have 2 kitties who are always getting into things when I'm gone. Would love to see what they do. We are home with the boys most of the time, but my daughter desperately needs this to watch her dog. She gets into so much mischief! I am M. K. Clinton's daughter and I can completely attest to this. We DESPERATELY need one of these bad boys. She gets into a lot of trouble! Lol - is it Paisley? She is so cute! I would like to find out how in the world something from a shelf near the ceiling falls to the ground aka how Ben got up there. I worry about my pets all day and would love to be able to see that they are okay when I am away. I work 2 jobs in a different city than I live so I am gone from them a lot unfortunately. Very cool! I have always wondered if the dogs park themselves in front of the doors/windows the whole time we are gone to work or wherever, or if they just know what time we get home and move there then. Great giveaway...thanks for the chance! I have always wondered what Nala and Pywacket do while we are gone especially since Pyewacket thinks she is a kitten again. I would love to see what my pet is up to during the day! I would like this to keep track of my kitties while I am away. Would love to see what my dog does while I'm at work! This would be perfect....always wanted to see what my Mocha was up to. One time i just went to use the restroom and she was sound asleep on top of the dining table. She suddenly woke up and made this cry as if missing me? I answered from afar and she ran to me. I know my Mocha and I are very attached and wondering if she ever cries alot when I am not home. That's interesting. My dog will sometimes be dead asleep and start crying/howling in her dream. I usually have to wake her up when she does this. Would love to see what my dog is up to during the day! 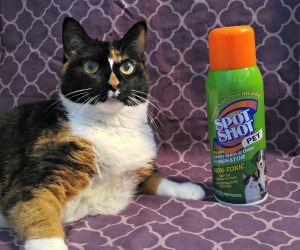 Why would anyone NOT want to laugh at their cat's antics when alone? i would love to see which girls do what, i have 2 that get into trouble....and sometimes i dont know whom to blame....however, usually the guilty one hides when i walk in the house...b/c the know what they did. also would like to know if the baby is messing with my oldest gal whom i hate to leave alone. I would really like to get one of these. Right now my dad is home all day with the dogs, but he will be going back on the road in a few months and I would like to be able to keep an eye on them when I'm at work. Mr. N has separation anxiety and I get worried about him when I have to leave. I would like to know which basset hound gets in the garbage first. I know they all eventually do it, but who initiates it??? With six dogs, sometimes I need to identify who does something when I'm not around. This would help with that. Thanks! TW knows I sleep while she’s out but she swears there’s a “gum gnome” who comes in here and helps himself in the refrigerator although since she doesn’t have a smart phone she might not be able to use it. We have to keep extra keys in the lobby and things are always disappearing. We currently use an old smartphone as a camera to check on the pups while we are gone. It is nice to be able to make sure they are staying out of trouble, but it has many limitations: no night vision capabilities, can't move it remotely, is in a fixed and awkward location... This camera would be so much nicer. Would like to see what my dogs are up to when I'm not home. Hi, it is wonderful security camera for pets security. Keep it up to share information about security camera. I would love to win this. I I red to spy on my pets and see which Houdini is getting the treat jar open and scaring them down. I have my suspicions. Cool!Thanks for the giveaway. 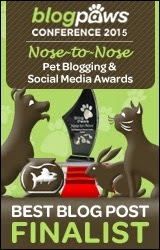 It would be great to check n monitor my pets.